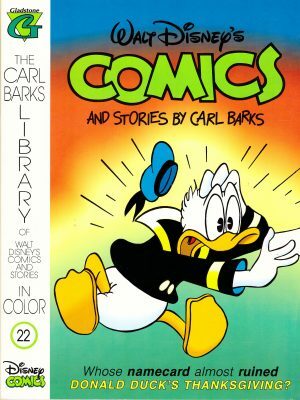 While wonderfully drawn by Batem with contributions from Marsupilami’s creator André Franquin, The Marsupilami’s Tail was slightly disappointing for being a series of gags strung together with no great unifying plot. Bamboo Baby Blues fixes that. 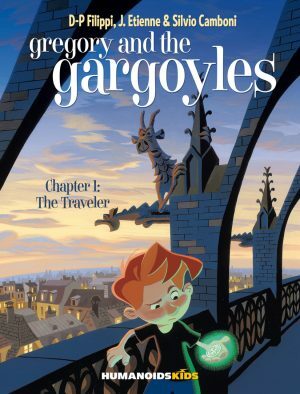 It’s long been established that Marsupilamis come from South America’s jungles, in Palombia to be precise, and in the opening pages writer Greg introduces a number of elements that will become key to the series. Those pages showcase the worst of South America, with a military dictatorship, corruption and exploitation rife, German residents of dubious origin and a total lack of environmental concern. They’re densely plotted and hilarious, incorporated into the backstory of two Chinese bringing a baby panda to Palombia in search of bamboo. As the Marsupilami finds out when everything goes wrong, that’s all it will eat. Fortunately there seems to be a fair bit of bamboo used in constructing houses and tools in the local tribe’s settlement. 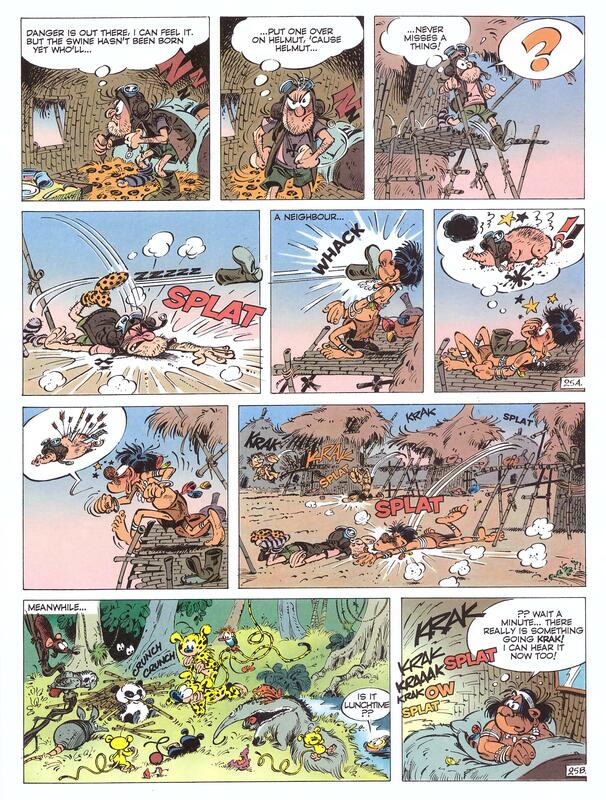 Again, how much Franquin contributed to the art is unknown, but Batem adjusts so well to Franquin’s style that it’s irrelevant. The Marsupilami series is brilliantly drawn, and utterly charming. It’s loose, busy, character rich and stunningly choreographed to produce maximum effect from gag after gag. This is slapstick humour, but crafted to the highest standards. 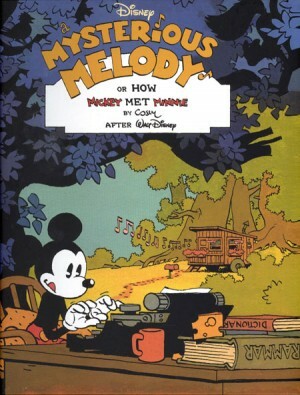 For most of the book Marsupilami is just a background character seen collecting bamboo to feed the baby panda, while what it’s taken causes accidents and misunderstandings between the various tribesmen and the their guest, disreputable German pilot Herman Ersatzausweis von Lilimarlehn. In the punning Asterix tradition of names, his translates as Lili Marlene’s fake passport, and like the explorer in The Marsupilami’s Tail, he’s the vaguely competent voice of reason befuddled by all that’s going on around him. A recurring supporting character is a local tribesman who speaks in a form of pidgin English (or French in the original), and translator Jerome Saincantin deserves credit for his imaginative dialogue. 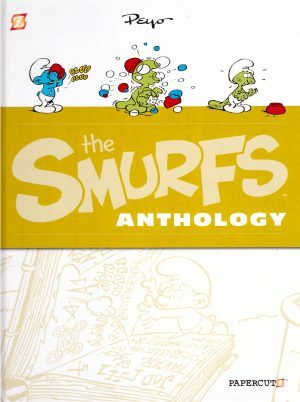 In the original edition it’s deliberately muddied, and the use of phonetic spelling in English, descriptions rather than specific words and separating syllables combines well. Laugh follows laugh follows laugh. 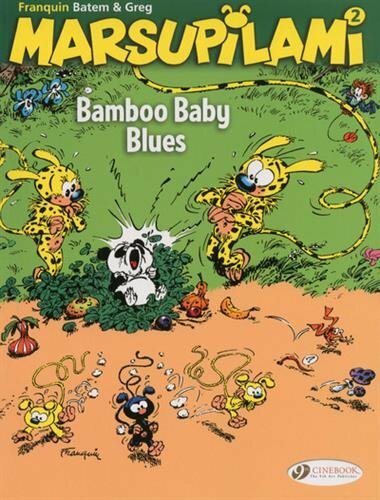 The Marsupilami series might have been a relatively late entry in the canon of classic Franco-Belgian all-ages comics, but Bamboo Baby Blues matches the best of them.